BUNGALOW IN CALPE (COSTA BLANCA) WITH COMMUNAL POOL, for maximum 6 people. LAY OUT: This charming house is divided on two floors and connected by an external staircase. On the main floor there is 2 bedrooms (one with double bed and the other 2 single beds) and a bathroom with a bath. There is an ample space comprising lounge, dining room and an open plan kitchen. Upstairs, where we access by an outside staircase, is the second bedroom with 2 single beds and an uncovered terrace. EXTERIOR: The plot is completely enclosed, with a nice garden of cypress trees, various other trees and plants. The house has access for the car so as to park inside the plot. It is located in a complex with communal pool and gardens, where you can swim, refresh yourself and sunbathe. 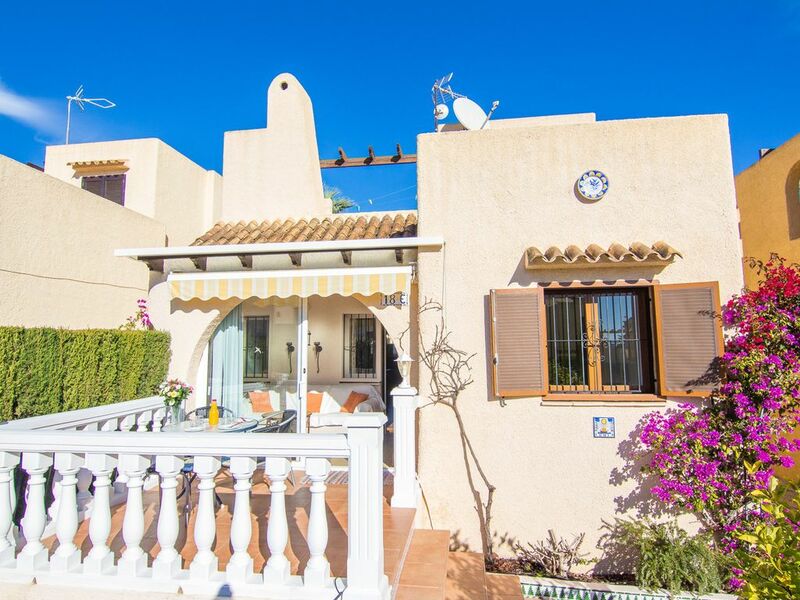 LOCATION: Located in a residential area just 1400 meters from the Mediterranean Sea and the sandy beaches of Calpe. Very close to supermarkets and restaurants. OTHER: WIFI INTERNET FREE. AIR CONDITIONING IN THE ROOM.